Latest News : DON’T GET A PENALTY. JUST BUY A TICKET. G:link and the Gold Coast Titans have teamed up for 2019 to highlight the go card as the best way to ride the G:. All you need to do is touch on and touch off at the card reader on the station platform at the beginning and end of each trip; and to make it easy topping up your go card with $, there are ticket machines located at every G:link station. 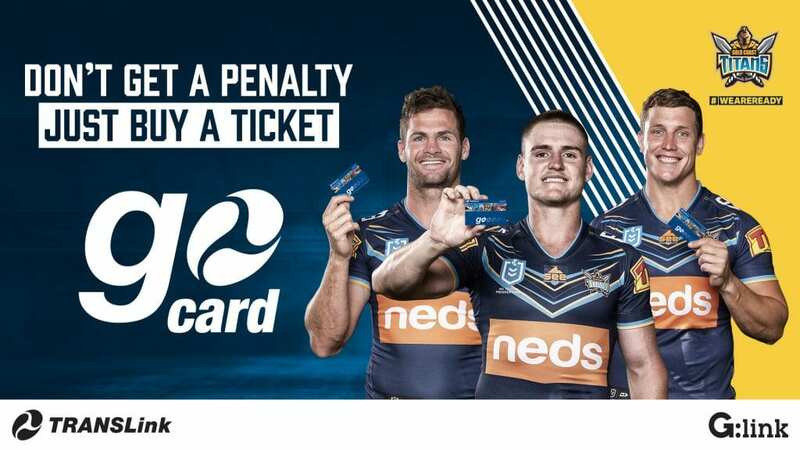 Just like in rugby league there are penalties for not following the rules and G:link is no different, it’s the law you must have a valid ticket when travelling on the tram. The fine for not having a valid ticket is $261 vs a peak time adult go card of $3.31. We know which we would rather pay. For more information about fares, ticketing or to plan your journey, visit translink.com.au or call 13 12 30 anytime. Public transport is the best way to get to Cbus Super stadium on game days. Just show your event day ticket to access the free public transport services. Free transport with your event ticket is available on G:link services four hours prior to the main event until 4 hours post the end of the event. There is a free shuttle bus to Cbus Super stadium from Broadbeach South station. Visit the TransLink website or contact TransLink on 13 12 30 for all transport information. Use the TransLink journey planner to plan your journey and get ready to cheer on the Gold Coast Titans!